The seventh collection of fun and inspiring children's worship songs! The seventh collection of fun and inspiring children's worship songs — with instrumental versions as well! The classic children's collection of Christian music is back! 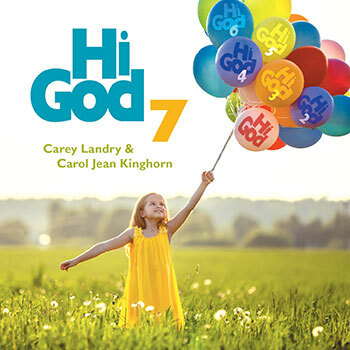 From the musical duo of Carey Landry and Carol Jean Kinghorn, Hi God 7 utilizes their signature combination of education and worship. Each song contains memorable tunes that the young members of your parish or family will love to sing. Through God's grace, each child will grow in appreciation and understanding of their faith. Many of these compositions mesh perfectly with moments of meditation in the liturgical year. "God-with-Us Forever" is an Advent hymn that works well with both a children's choir or entire assembly. It is ideal for the offertory or Communion rite, but fits with any moment of worship as well. "Born to Be Our Savior" is an upbeat and joyous song that can be sung during mass around Christmastime. However, it can serve as the spotlight arrangement for a child's Christmas pageant. "We Are the Light of Christ" is a powerful song of devotion and dedication to the following of Jesus. It shows the commitment of faith and the unification of Christians, especially during Easter, Pentecost and Confirmation ceremonies. In addition to "God-with-Us Forever," many of these songs have been composed for children during First Communion or the Communion rite as a whole. "Jesus Come to Us," "Jesus, You Are Present" and "Love is the Best Gift," all serve as reminders of our joining in the name of Christ. And for younger parishioners, these songs will grow in their hearts as they embark on their personal journey through the church. Don't forget to check out the CD and Digital Playlist — both containing instrumental versions of the music so you can sing along!